It’s no secret how popular cement tiles have become in the past few years. It seems everyone from top celebrity stylists to DIY bloggers have realized the many benefits and ways to use cement tiles for top-notch personal style. Just about everyone who knows cement tiles knows that they are often used for kitchen backsplashes, interesting floors, and spa-like bathrooms. But where else can you use cement tiles? There are many unexpected ways you can incorporate them to truly set your space apart. There are certain places where cement tiles should not be used. Cement tiles should not be used outdoors in cold climates with freeze and thaw cycles, or in extreme heat like inside of pizza ovens or inside fireplaces. Cement tiles should also not be used near chlorine water such as near pools and hot tubs because the pH-balancing chemicals can damage the tile. Driveways are also not ideal for installing cement tiles unless they have a strong foundation to support the weight of vehicles. Rather than use cement tiles on the kitchen backsplash tile or bathroom wall as expected, use them as an accent instead or in addition. Frame the inside or outside of the front door with cement tiles for a statement entryway. For extra pop, tile any archways in your home to create stylish transitions. It may seem obvious to use tiles on the floor, and even on walls, but what about creating a medallion or mural underfoot in a foyer or on a statement wall using a series of patterned cement tiles? You can simply create an interesting shape or monogram. A ceiling is certainly an unexpected place for cement tiles. It is something you won’t see in many houses or restaurants. Make a bold statement with colorful, patterned cement tiles to create interest in the above ceiling space while keeping the walls and floors simple and neutral. Crown molding is an attractive feature that can enhance both modern and traditional spaces alike. It gives a room character and charm without turning to fast-burning trends. One way you can elegantly combine a classic look with personal style is to use cement tiles around the top borders of a room to mimic the look of crown molding. If you like the idea of a colorful accent but don’t like the idea of painting the crown molding, patterned cement tiles will deliver a sophisticated and custom look. 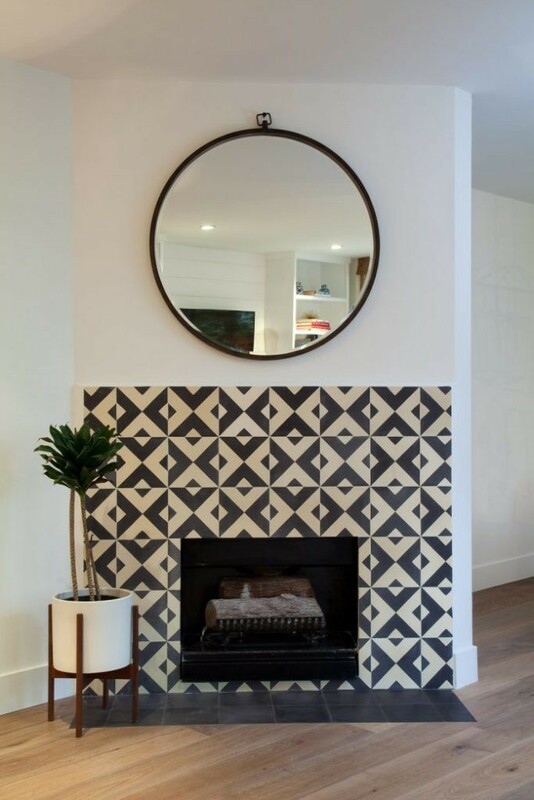 The face of a fireplace is a popular place to accent a room with cement tiles. You can go further and do something unique by creating a permanent piece of art above your mantel using cement tiles. If you ever want to change things up, stand a picture or mirror over the cement tile design and uncover it when you want to showcase it again. The backsplash isn’t the only place to use cement tiles in the kitchen. Turn your kitchen island or peninsula into a feature in and of itself with unique cement tiles. Your options are endless. Tiles don’t have to be colorful or intricately patterned if you prefer to keep the statement minimalistic with neutral colored tiles or in a large geometric pattern. Utilize the otherwise plain underside to balance out the tile pattern. Extend the backsplash in the kitchen up the entire wall and include the open wall space behind shelving to keep the focus on the unique tiles and maintain a perfect balance between simplicity and visual texture. Add even more elegance to columns by installing cement tiles on and around them. If you have any structural posts that weren’t exactly design choices, you can turn them into purposeful elements that look intentional with a cement tile wash.
Cement tiles are just as versatile in color and pattern as they are in their many potential uses. Get in touch with the design and sales team at Mosaic Morocco. We will help you choose a cement tile design that’ll enhance your home with your unique personal style.